The destructive consequences of a parasitic Tyranny of the Wealthy and Majority have yet to play out, but they will, and sooner than most believe possible. One of the core concepts of my work is that our state-cartel dominated economy is fundamentally a vast parasitic skimming machine that redistributes the nation's earned wealth to two constituencies that support the skimming operation: those at the top of the financial pyramid (i.e. super-wealthy cronies who fund the political careers of the political elite) who constitute a Tyranny of the Wealthy, and state dependents who constitute a Tyranny of the Majority, i.e. they will support the political elites that guarantee their share of the swag, regardless of the consequences to the nation or the economy. In other words, these two self-serving groups see the productive economy as the host that the state feeds off to fund their swag: at the top of the pyramid, the swag is unlimited nearly-free credit issued by the Federal Reserve and various tax breaks; at the bottom of the pyramid, the swag is unlimited free services in the form of social programs such as Section 8 housing, easily gamed disability for life, food stamps, free medical care via Medicaid, etc. The destructive consequences of a parasitic Tyranny of the Wealthy and Majority have yet to play out, but they will, and sooner than most believe possible. Those being sucked dry will never have the wealth or votes to reform the current system, so their only choice is to opt out and choose to live as independently of the state-cartel Status Quo as possible. This parallel economy is the community economy, the resilient, decentralized, entrepreneurial sectors of the economy that not just survive without state subsidies but thrive outside centralized dependency on the state. What is the foundation of a productive economy? Correspondent Jeff W. provides an intuitively insightful answer: trading circles. The trading circle is a concept I came up with in order to try to think clearly about economic issues. A trading circle is any group of people who trade with each other on a regular basis. I use the term "trading circle" instead of "local economy" because it helps me picture the actual traders involved. Unless you are Robinson Crusoe, you participate in a trading circle. Money, of course, is a medium of exchange. People trade their goods and services in the trading circle using money as a convenience. People have to work AND trade in order to survive. Government counts time away from paid work as leisure time, but you have to go to the grocery store and trade your cash for food if you want to survive. Activities needed for basic survival are not leisure. Trading for basic necessities is part of the work humans have to do (unless they are Robinson Crusoe). Trading circles can be growing or shrinking, becoming richer or poorer. To picture a simple trading circle, picture a few people on a remote island: one fishes, another makes clothing, another builds huts. They trade with each other. Specialization of labor benefits everyone. Traders participate in the trading circle as equals, though some may do hundreds of times the business as others. Every participant is allowed to trade. Exceptions to this rule are a king, who does not get his money by trading but through taxation or money printing, and a moneylender, who trades valuable money for promises written on paper. Both the king and the moneylender claim legal rights over their subjects/debtors that ordinary traders do not claim. People do not get rich outside a good trading circle. Put Warren Buffett in Bangladesh and he will struggle just like everyone else. Your fortune depends on belonging to a good trading circle. The trading circle is self-correcting in terms of dealing with gluts and shortages. Participants move from one line of work to another according to the advantages they see. The trading circle tends toward efficiency, improved quality, and reduced prices. It is a progressive institution in that sense. Its free operation tends to make everyone richer. A trading circle must guard against thieves. Today, America's trading circle, however, is basically owned and operated by thieves. America used to be known for having good quality products at low prices. That was back when our trading circle was functioning properly. Sick people, the very old, and the young do not directly participate in the trading circle. Society must make provisions for them (such as having strong families to take care of them). If the young are not cared for properly, society does not survive. Robots tend to kick people out of the trading circle. People who are dependent on the state are only partly in the trading circle. They are consumers but not producers. The same goes for government workers. They are thus not full members of the community like the full participants in the trading circle. A good community tries to find niches for the young people in the trading circle. The trading circle may be an unforgiving competitive environment, but the community in which the trading circle resides need not be such an environment. The trading circle works best when everyone focuses on his own self interest. Altruistic and charitable work should take place outside the trading circle. A corrupt government kicks everyone out of the trading circle who is not an insider or who does not pay bribes. This leads to higher prices and reduced quality, which is the usual condition of most trading circles historically. When I think about an economic issue, I always ask, "How does this affect the trading circle?" A person's niche in the trading circle as a producer and seller is primary; his role as consumer is secondary. If you have a good niche as a producer, you automatically have the means to be a consumer. This is another way of expressing Say's Law, which is that supply creates its own demand. If you lose your niche as a producer, your ability to be a consumer is impaired because you have lost your income. A person often obtains his niche by degrees. In the old days, there used to be unpaid apprentices, paid apprentices, journeymen, and masters. The master craftsman was a guy who had earned a solid niche, and he usually employed journeymen and apprentices. Success of the trading circle hinges on business profitability. That is where all the factors come together to determine if a person can stay in his niche or whether a new niche can be created. A niche in the trading circle must be continually earned. Even if you inherit a business, you still will have to work to ensure its survival. Earning a niche in the trading circle is like physical exercise: no one can do it for you. Government can give you a half-participation in the trading circle, where you are a consumer but you don't produce anything. Since taxes and inflation harm full participants, there is no free lunch in adding government-supported consumers. Government cannot give you a niche as a producer--or they can only do it through the corrupt act of giving you an unfair advantage. Thank you, Jeff, for explaining the concept of trading circles. One way to understand why our economy and society have become unsustainable is to grasp the difference between an economy based on productivity and a level playing field and one based on debt-funded consumption and a corrupt playing field tilted to benefit the few and buy off the many. That's the economy we have now, and it's the fundamental reason why a systemic financial crisis that disrupts the state-cartel Status Quo between 2020-25 is so predictable. Test drive the first section and see for yourself. 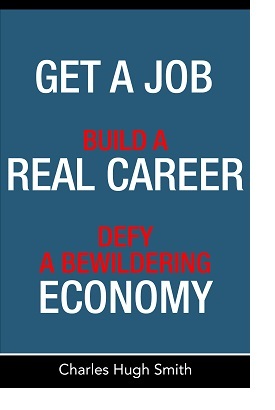 Kindle, $9.95 print, $20"I want to thank you for creating your book Get a Job, Build a Real Career and Defy a Bewildering Economy. It is rare to find a person with a mind like yours, who can take a holistic systems view of things without being captured by specific perspectives or agendas. Your contribution to humanity is much appreciated." Thank you, Paul C. ($100), for your outrageously generous contribution to this site -- I am greatly honored by your longstanding support and readership. Thank you, Michael S. ($20), for your much-appreciated generous contribution to this site -- I am greatly honored by your support and readership.